UPDATE: After some reflection, I've added two more titles that definitely belong on the list. See below. As we wrap up 2014, I thought it would be a good idea to put together a list of some of my favorite reads of the past year. Of course, coming up with a "best of" list is painful--there were so many great books I read this year and I can't write a long post. But in order to keep this short and meaningful (a list of 10 is just going to be too long), I'm going to list 5 7 of the most important books I read this year. 1. Notice I said these are seven "of the most important books". I can't say for sure these are the most important books; I've just left too many good ones off the list. If I had to come with the list of the m seven most important books, I'd agonize over it for so long that I'd never be able to finish this post. 2. Not all of these books were released this year. The point is, I read them this year so they are still new to me. With those caveats in place, here are my picks. 1. 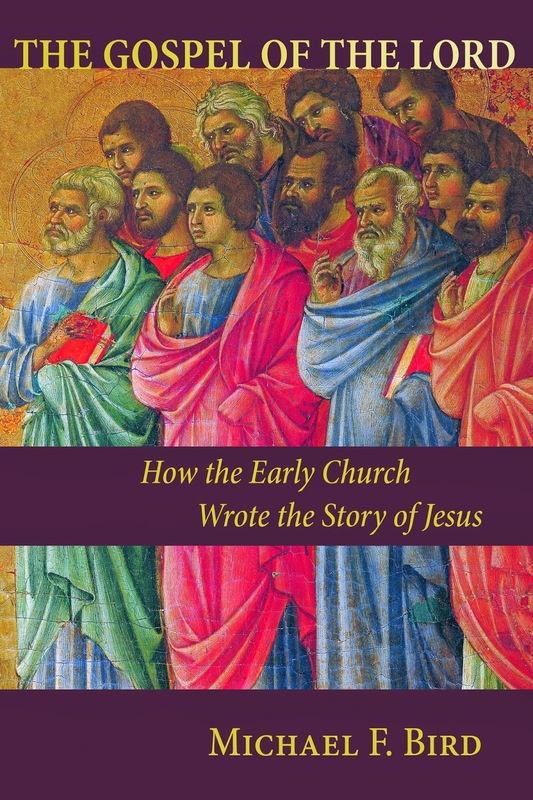 Michael Bird, The Gospel of the Lord: How the Early Church Wrote the Story of Jesus (Grand Rapids: Eerdmans, 2014). Bird's book, which I just recently finished, is a tour de force of Gospel scholarship and research into the transmission of the Jesus tradition. I can't say enough nice things about this book--in fact, expect a post or two on some elements of Bird's book in the future. 2. 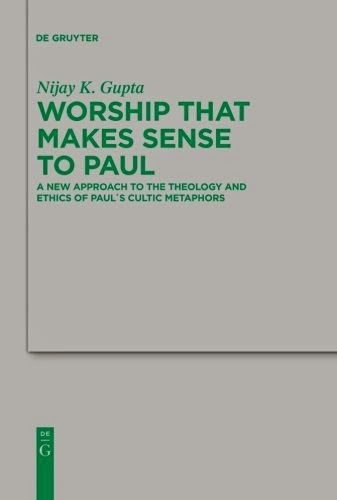 Nijay Gupta, Worship That Makes Sense to Paul: A New Approach to the Theology and Ethics of Paul's Cultic Metaphors (Berlin: De Grutyer, 2010). This year I poured myself into Pauline research with particular attention to soteriology and cultic imagery in Paul. This book by Nijay Gupta was particularly exciting. I've already posted on the book this year but I have to mention it again here. 3. Henri de Lubac, History and Spirit: The Understanding of Scripture According to Origen (San Francisco: Ignatius Press, 2007). De Lubac was one of the most influential patristic scholars of the twentieth century. This reprint reproduces some of his most important--and revolutionary!--research on Origen. 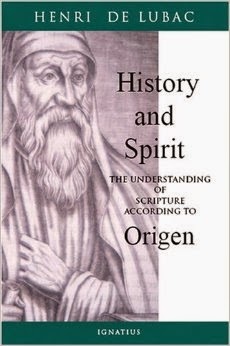 Origen denigrated the value of history in favor of spiritual readings? Well, that's what everyone says--except those who have read this comprehensive study. 4. 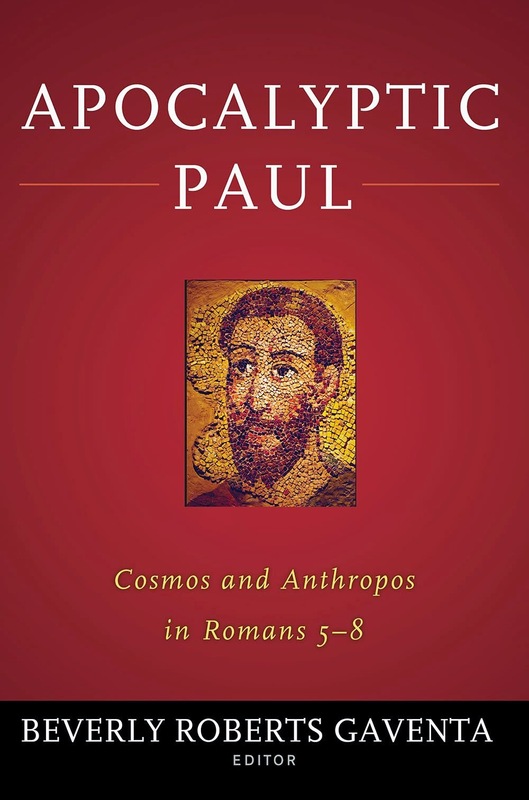 Beverly Gaventa, ed., The Apocalyptic Paul: Cosmos and Anthropos in Romans 5-8. (Waco: Baylor University Press, 2013). This book contains numerous excellent essays but the one by John Barclay takes the cake--at least, that's my opinion. Barclay demonstrates how Paul's understanding of "grace" fits well within first-century Greco-Roman attitudes regarding the nature of gift-giving. The soteriological implications are incredibly profound. I must say, Barclay's essay in this book may be one of the top five most important pieces I have ever read on Paul. No exaggeration. 5. 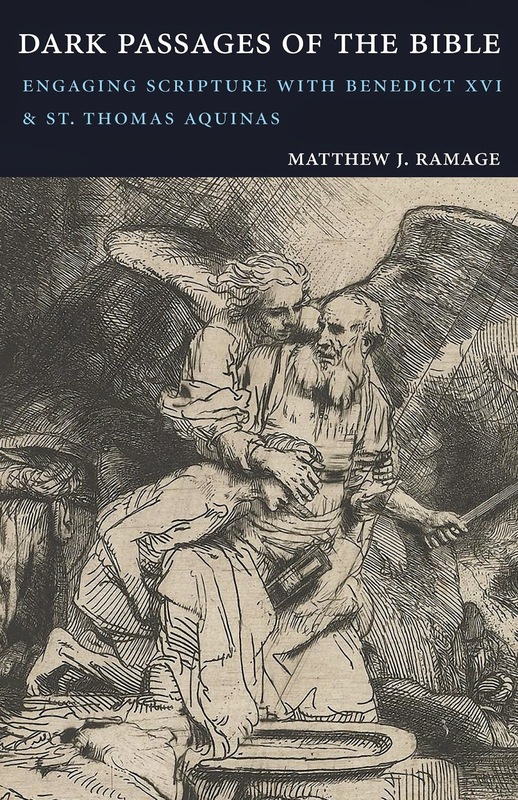 Matthew Ramage, Dark Passage of the Bible: Engaging Scripture with Benedict XVI and Thomas Aquinas (Washington, D.C.: Catholic University of America Press, 2013). I must say that I may be confused here and might have read this book at the end of last year. Either way, I'd like to give it a shout out. Ramage looks specifically at some of the thorny exegetical issues in Catholic biblical interpretation. Guided by Benedict XVI and Aquinas, Ramage offers a wonderfully thoughtful approach to the difficult question of how some of the challenges of historical-critical methodology can be engaged in a way informed by Catholic tradition. UPDATE: Even though I was going to originally keep this list to five works, I had to add two more titles that I somehow failed to include above. Even though there are still many other books I could mention here, few works have been more impactful on my thinking than the two below. Apologies to Chris and Ben. 6. 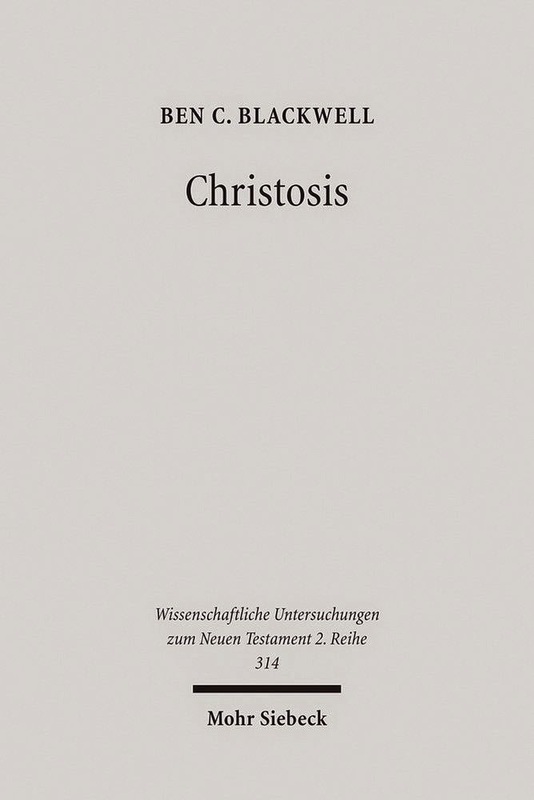 Ben Blackwell, Chistosis: Pauline Soteriology in Light of Deification in Irenaeus and Cyril of Alexandria (WUNT 2/314; Tübingen: Mohr Siebeck, 2011). How I ever left this book off of my original list, I'm not sure. It might be because I first looked through it in 2013. Whatever the reason, I couldn't possibly neglect to mention it here. This easily should have been on my list. It was certainly far more important for my thinking than even the De Lubac work. Put simply, this book is one of the most important monographs I have ever read on Pauline soteriology--in terms of my own thinking, it might even be the most important one. And, yes, I mean that. In sum, Blackwell shows how patristic exegesis helps unpack Paul's thought. Specifically, Blackwell focuses on the way the fathers' understanding of theosis faithfully explicates what is found in the Pauline epistles. To sum things up, Blackwell shows that, for Paul, salvation is about so much more than merely being "acquitted"; it involves nothing less than participation in the divine life through union with Christ. Other scholars have also argued that the concept of theosis accurately captures Paul's reading. Here, in particular, I think of Michael Gorman, from whose work I have also learned much. What I particularly like about Blackwell's work is his command of patristic sources. Contemporary exegesis often distances itself from Christian interpretive tradition. Either modern scholars convince themselves that we have simply moved beyond ancient Christian writers (and so, conveniently, we need not read them) or, worse, they simply dismiss their works, imagining that the earliest Christian thinkers grossly misunderstood the New Testament writers (implying a kind of scholarly triumphalism--no one really read the New Testament correctly until we can along). While it is certainly true that the fathers do not engage certain important critical issues that contemporary scholarship has helped to shed light on, I believe we lose much by ignoring them. Ignorance is certainly not bliss. 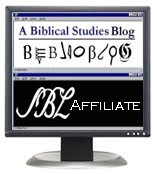 Let me be clear: it is true that contemporary biblical scholarship has helped shed important light on the biblical texts. Among other things, materials like the Dead Sea Scrolls have made it possible for us to have a much more nuanced understanding of certain aspects of the Judaism of Jesus' and Paul's day than the fathers could have attained. This shouldn't be surprising. For example, the Greek fathers knew the biblical language extremely well--after all, it was their native language! I could go on and on about specific aspects of Blackwell's important work but let me just say that it demonstrates the advantage of retrieving patristic readings in spades. If you pick up just one book on Pauline soteriology, let it be this one. 7. Chris Tilling, Paul's Divine Christology. (Grand Rapids: Eerdmans, forthcoming 2015). I also originally left this off the list. That was also a major mea culpa. Suffice it to say, this book is, in my opinion, the definitive work on Paul's Christology. Well-researched, carefully nuanced, and convincing, this book tackles a very complex subject with clarity and thoughtfulness. 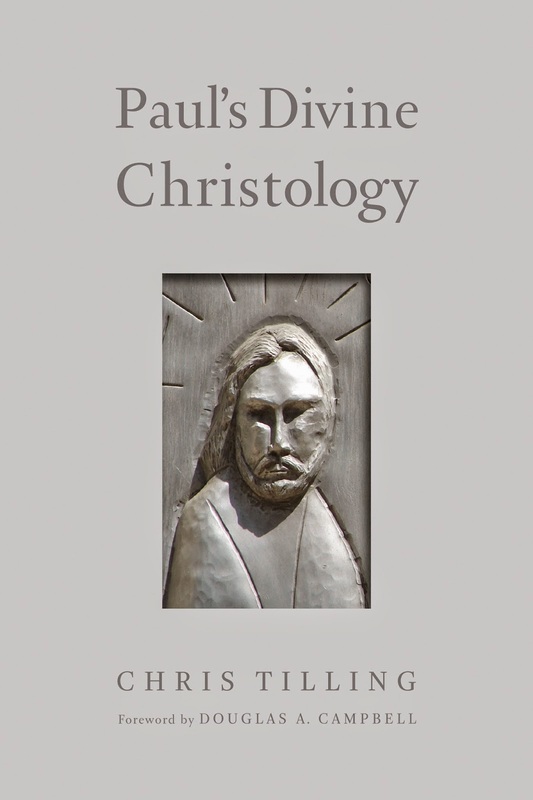 Whereas other treatments of Paul's Christology focus on titles or limit their analysis to a handful of passages, Tilling looks at Paul's Christology against the larger matrix of his overall thought, examining numerous themes and facets of the Pauline corpus. At the same time, Tilling drills down into specific issues with exegetical rigor, offering numerous insights. Perhaps my favorite part of the book is his analysis of Paul's Christology against the backdrop of Enochic literature. I won't spoil the surprise but let's just say he makes some tantalizing suggestions, which I find quite compelling. Tilling's monograph, a revision of his doctoral thesis, was originally published by the prestigious German publisher, Mohr Siebeck. Unfortunately, although Mohr Siebeck is about as respectable as you can get when it comes to academic publication, the titles in their catalogue are not cheap. This meant the book was out of the price range of most readers. Yet, despite the hefty price tag, the book has received a great deal of attention and praise--and rightfully so! I'm therefore delighted that it is being republished by Eerdmanns, an American publisher. Eerdmans is doing a nice roll out for the book, giving it the attention it deserves. Their reprint will also make the book much more affordable and help it find a wider audience. The book's significance is also underscored by the fact that the new release will also feature a Foreword by Doug Campbell. In sum, expect to hear the name Chris Tilling a lot in the coming years as this seminal work is establishing him as one of the most important names in the future of Pauline scholarship. As with Blackwell's book, I can't say enough about Tilling's. It easily should have made it into the top five above. The reality is, since I worked through it prior to this year it simply didn't come to mind as a "new find" for this year when I first wrote this post. Nevertheless, I had to rectify the situation by updating this post. Suffice it to say, this was definitely one of the most important books I worked through this year. thank you! You will keep my husband busy for a long while. He respects your opinion. May you and yours have a joyous New Year!